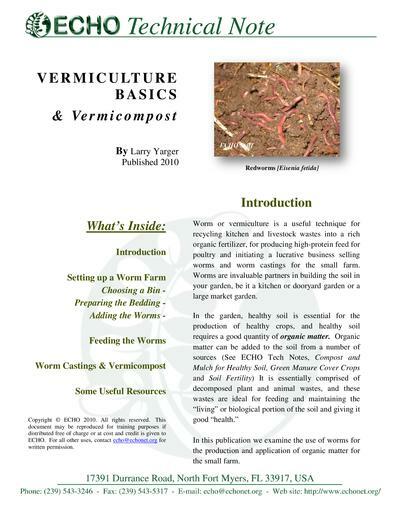 Worm or vermiculture is a useful technique for recycling kitchen and livestock wastes into a rich organic fertilizer, for producing high-protein feed for poultry and initiating a lucrative business selling worms and worm castings for the small farm. Worms are invaluable partners in building the soil in your garden, be it a kitchen or dooryard garden or a large market garden. I have been using one-third composted horse manure, one-third rabbit manure (fresh fine), and coffee grounds and rotted greens (nothing seeded) to fill half of an old bath tub keeping it covered to keep pest and sunlight out when one side fills I start the other side with fresh batch and uncover the full side to let some light and drying begin and the worms move over to the new pile. With 2 tubs and staying on top of it I can easily harvest 5 to 10 gallons of worm casting a month.